Romania’s current Minister of Justice, Tudorel Toader, was born in 1960, in the Vulturul village of Vrancea County. He completed his primary and secondary education in Vulturul (1967-1975), Vrancea County and at the „Unirea” Industrial High School in Focşani (1975-1979). He fulfilled his military service between October 1979 and February 1981 at Military Unit. 02841 from Turnu Severin, Mehedinti County. Between February 1981 and August 1982 he worked as an insurance agent at the ADAS Branch Vrancea. In September 1982 he was admitted to the Faculty of Juridical Sciences in Iasi. He obtained his undergraduate degree in June 1986, scoring a 10 for his diploma essay. He was then assigned as a prosecutor to the Panciu Local Prosecutor’s Office where he worked until 1989. Politically, Tudorel Toader was not just an ordinary Party member. He held important positions in the Communist Youth Organization (UTC) and the Romanian Communist Party (PCR). He served as Secretary of the UTC Basic Organization of the „Unirea” High School in Focşani (1975-1979) and as the secretary of the Office of the Basic Organization of the Association of Communist Students of the Faculty of Law in Iasi (1982-1989). In November 1984 he became a fully-fledged member of the Communist Party. On January 18, 1985, the Municipal Committee of Iaşi of the Romanian Communist Party issued his membership card no. 3705174. 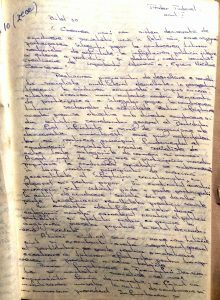 This data was recorded by himself in his March 30, 1989, biography: „During the 1982-1986 period I attended the courses of the Faculty of Law, Legal Sciences Section, of Iasi University. During my studies I served as the secretary of the ASC office for the year. ” (…) „In November 1984 I became a member of the Romanian Communist Party, becoming the holder of membership card no. 3705174, issued on January 18, 1985, by the Communist Committee of Iaşi of the Romanian Communist Party „. Between 1986-1989 he was a member of the PCR-Justice Organization at Panciu Local Prosecutor’s Office. The Panciu Local Prosecutor’s Office structure was subordinated horizontally to the Panciu Commune of the Communist Party and to the Vrancea Special Sector of the PCR that guided and controlled the work of the basic organizations of the Securitate, Judiciary, Militia and the Army. His unwavering commitment to implementing the Party’s directives led the Panciu City Committee’s leadership to propose that Tudorel Toader serve as secretary of the Office of the Prosecutor’s Local Organization in August 1989. 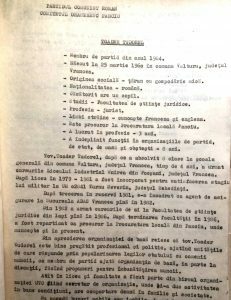 Moreover, after attending the courses of the Political University in 1989, comrade Tudorel Toader was classified as a PCR propagandist at the political-ideological education circle of Panciu City Council. „The unit of action in the construction of socialism and communism exists and must develop within the concrete historical conditions of each country, and of every communist ruling party. There are no templates … directions can be drawn for all the socialist countries, but none of them can give up the fundamental principles created by Marx, Engels, Lenin, and all the revolutionary practice. Another theme analyzed by Tudorel Toader was „Creating a new democratic system for leading society, unique in its own way, which ensures the participation of the entire people in the leadership of all sectors of activity, in the implementation of the internal and external policy of our Party and our socialist state, achievement of historical importance of the Nicolae Ceausescu Age „. The Communist Prosecutor speaks of „a number of workers’ democracy bodies that, through their work fulfill the fundamental principle of the leadership of our socialist society by all categories of working people. This way of engaging the participation of the masses in the leadership of society subsumes in our country the principle of the utmost generality of the realization of socialism, with the people and for the people „. Another way of working people’s participation in the decision-making process is periodical consultation through referendum, on the most important issues and by the large popular assemblies organized by the general secretary of the party „(ie by Nicolae Ceausescu). In other words, Comrade Tudorel Toader told us in 1989 that all power was in the hands of the people. Theoretically yes … ..practically … all this power was in the hands of the dictator Nicolae Ceausescu and those around him. As a communist, Tudorel Toader enjoyed the appreciation of his colleagues from the Panciu Prosecutor’s Office. For example, a prosecutor, a PCR member in the Prosecution-Justice organization, who featured from 1987-1989 as a „SA” (vetted source) in the informative network of Panciu, Lieutenant Colonel Bulăreanu Gheorghe from the First Service (internal information) of Vrancea Securitate section, gave a positive characterization about colleague Tudorel Toader on March 30, 1989: ” I know Comrade Toader Tudorel since September 1986. He is a prosecutor at the same prosecution unit as me and a professionally and politically well-trained colleague with correct behavior, worthy of family and society. 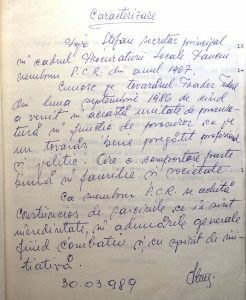 Tudorel Toader’s attachment to PCR policies is also apparent in the characterization provided by the chief secretary of the Panciu Local Prosecutor’s Office, Popa Ştefan, a PCR member since 1967: „I know Comrade Tudorel Toader since September 1986, since he came to this Prosecutor’s Office as a professionally and politically trained comrade. He has a very good behavior in family and society. As a member of the Communist Party, he conscientiously fulfills the tasks entrusted to him, being combative and showing spirit of initiative in general assemblies„. 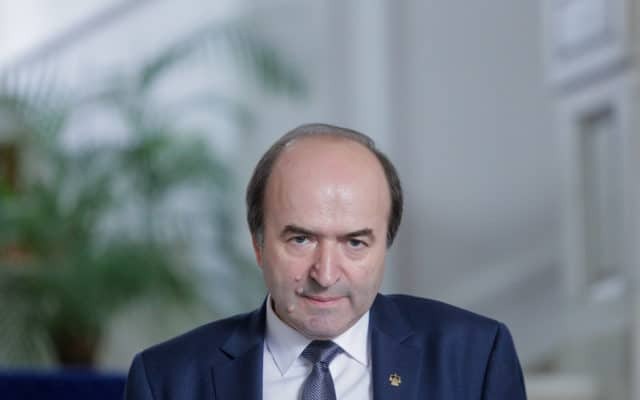 The fact that people with direct connections to the former Securitate and seniority in the Party appreciated his political activity shows us that Tudorel Toader was a trusted man of the communist regime in Nicolae Ceausescu’s Romania. Bogdan Constantin Dogaru is a graduate of the Faculty of Archives in Bucharest, the 2004 promotion, specialization in archival-history ; graduate in 2008 of master courses (contemporary archival specialization) at the same faculty; author of works, studies and articles on the history of Jews, the history of civil society (societies, associations, clubs) and the history of secret services. nu zicea el ca trimite nu stiu ce? na, ca pot si altii sa scrie in engleza. fac pariu ca siteul asta e citit de multe ambasade de la bucuresti. ia de-aici bubos jegos si hot. Alegerea dnei LAURA CODRUTA KOVESI din DNA ROMANIA ar fi un semnal de sustinere pt poporul roman sa continue lupta anti-corutie si sa sustina statul de drept fara frica ! Succes , Laura Codruta Kovesi , DNA Romania – sunt multi hoti si multe fonduri europene de recuperat si redirectionat pt dezvoltarea intregii Europe ! GO , Codruta ! Prinde-i pe hoti si recupereaza banii !!! Ce prejudiciu a recuperat Kovesi de la EADS?